Visionaire 5 Public Beta Test now live! as promised I have uploaded the beta version. So here comes the full disclaimer, changes and warnings. The beta is fully functioning without the exporting feature. Also Windows-only for now. Beta means, there will probably be bugs, we didn't find yet. And also we are reaching out for your feedback. The beta can be installed alongside 4.2.5. Once you save your ved with the new version, you will not be able to load it in 4.2.5. The new editor works on top of DirectX 11 and requires feature level 10 (will complain about that in this case). If it doesn't work you can try DX9 or OpenGL with the command line (-dev gl / -dev dx9). XP is not supported by the editor. Old particles are not updated by the new editor and cannot be used. So keep an update if you want to recreate them. The menus are currently not staying open, so keep the finger on the button. For the lua functions I will add scripts later, also an updated shaderscript. Thanks so much for all your hard work. Especially over the last year! Nice work! Gonna try it tomorrow. Hi Simon, firslty thank you so much! I would like to ask what you mean by "In-scene-videos", ... so can can we now play videos as scene objects in the scenes, instead of image sequances??? First impressions from interface - it looks and feels just great - fresh and modern, I love it. Need to adapt to it alittle though. ~'Properties' tab of the 'Interface' elements is partly hidden by default, so I resized it manually (not a big deal). After changing category ('Interfaces' > 'Characters' for example) tab's size resets, so I need to resize it again. I think it is a good idea to store its last state if it is possible. Thanks again. It's cool to know further software development is breathing and alive! Cheers mate. Bit late the now. Will check it out the morrow. Looking forward to seeing what's what & what's now capable with the new Lua functions. 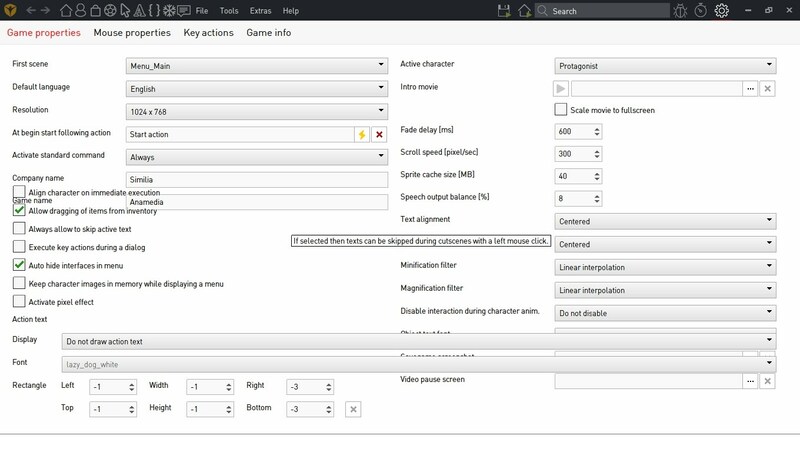 The typing action part selection thing Thomas showed in his commented video looks like it will be a huge time saver. New particle system is looking really nice too - maybe I will finally have a reason to use it as I've not bothered with it much before. Danke for the hard work. Now here's hoping you can put out some more frequent updates in the future! Wonderful! Thanks a lot guys for your efforts! I must try it now! I have a TV Monitor and my resolution is 1360x768 (native) and this is what I see when I open the project. Thank you for your hard Work. Unfortunately, I have pretty quickly stumbled upon a few Problems. I wonder how many more there may be if I dig a little longer. When I start up my Game, I first see my Verb-Coin-Interface on a black Screen. Then I see the Scene fade in from black, but the Scene is rendered bigger than my Window (which is smaller than the original Size of the Game), and the Verbcoin is still visible. Then the Scene once again fades in from black, now at the right Size corresponding with the Window-Size, and the Verbcoin is finally invisible. My Day-Night-Shader does not show up at all -- just a simple Shader changing the Screen-Color. Another simple Shader I applied to a River-Object to make it wavely distort does not work either, no Shader visible. Another Shader with changing Screen-Colors does at Least show, but it doesn't work like it should -- but it is also connected to the Day-Night-Shader, so maybe the one Shader's Lack of Functioning affects the other's. At Least I am no longer plagued by the most massive Stuttering when switching Outfits for Walking and Running, so that's a Plus. And then there are Things like what I would have shown in a Screenshot, but Paupasia already that -- I have the same Resolution, and exactly the same Problem. Frankly, I never understood why the Project-Settings are wasting so much Space, all these Options could just as well be presented with less Space -- it, after all, a rather crammed Part of the Editor, and cannot afford to waste Space. But what I really would have considered great would be the Possibility to zoom in or out of such a Menu, like I can in Blender (but I guess that is not a common Gimmick -- still, it's so useful). 1. what means "center position" in particle system? Center position in the room coordinate system? Or center position relative to the object position which the particle system belongs? 2. would be nice to can set the "center position" by simple clicking in room preview.